On a weekend when the box office is about to be dominated by the film adaptation of Frank Miller’s graphic novel 300, it’s worth asking: Can an adult still read a contemporary comic book and feel like an adult afterward? In the case of SCALPED, the answer is a resounding, bloodcurdling yes. 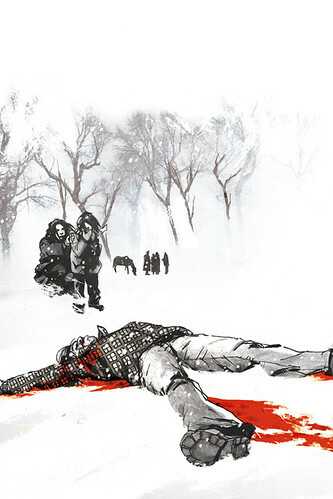 Written by Jason Aaron and illustrated with mordant relish by R. M. Guéra, the monthly serial takes the familiar noir formula of babes, bullets, and bad language to a place it’s never gone before: a dilapidated Native American reservation. As a story of corruption and redemption unfolds (and the bodies pile up), Aaron and Guéra pay tribute to genre masters from Mickey Spillane to Quentin Tarantino — they even have the good sense to name their protagonist Dashiell Bad Horse. 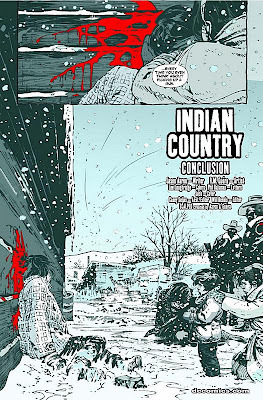 SCALPED #3 -- Final Version, originally uploaded by Jason Aaron. Vaughan recommended SCALPED for Y: THE LAST MAN fans looking for a new book in the wake of the latter’s pending ending. Vaughan went on to say that Aaron’s THE OTHER SIDE is one of the best things he thinks that Vertigo has published. Thanks again, Brian. And let me join the rest of the world's comic fans in saying, "Please don't leave us!" It's great to see you working on "Lost" and all, but what we really want to see are more comics from you now that all of your current books are ending. The photo here is from the Vertigo panel at last month's New York Comic Con. 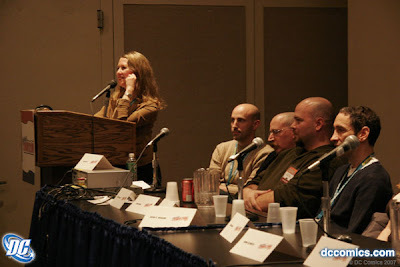 Left to right, that's Senior Vice President Karen Berger, writer Brian K. Vaughan, writer Brian Azzarello, yours truly and writer Douglas Rushkoff. There's a seven page preview of SCALPED #3 up at Newsarama. This is probably my favorite issue of SCALPED so far, both in terms of my story and Guéra's art. Look for it in stores this Wednesday, March 7.